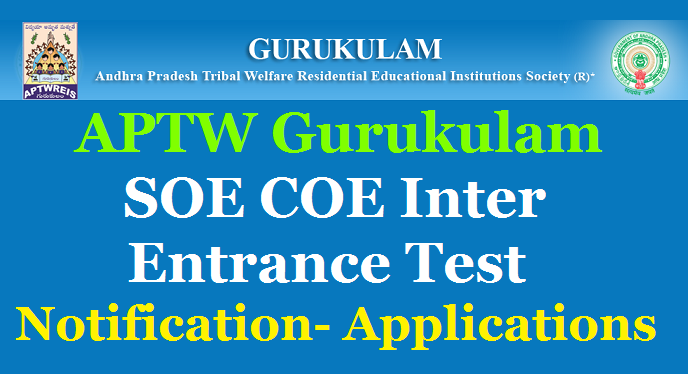 APTWREIS Gurukulam SOE COE Entrance Test 2019-20 Notification. APTWREIS Gurukulam Inter 1st Yr Admissions 2019-20 in SOEs & COEs , Notification, Applications, Counselling Dates. APTW Andhra Pradesh Tribal Welfare Residential Educational Institutions Society Amaravati, Notification Common Entrance Test for Admission into 8th Class in (04) SOEs & 1st year Intermediate with Integrated Coaching for IIT-JEE (MAINS AND ADVANCED)/ NEET/EAMCET for the year 2019-20 in (03) COEs and Vacancies in other SOE’s. APSWREIS /APTWREIS Inter Admissions 2019 – APTWRJC Entrance Test for Jr Inter Admissions in SOEs, COEs @ www.aptwreis.in or jnanabhumi.ap.gov.in APTWREIS Inter Entrance Test 2019-20 | Inter Admission Notification, APSWREIS Gurkulam Inter Admissions Seat Availability, Eligibility Criteria for APTWREIS /APSWREIS Inter 1st yr Admission Test 2019, Education Qualification, Age Limit, Selection Process, Application Fee, Reservation, How to Apply Online for APSWREIS Guruklam Inter Entrance Test 2019, APIWRJC CET 2019 Important Dates, Exam Pattern for APTWREIS Entrance 2019, Important Links for APTWREIS Gurukulam Inter Entrance Test APGPCET 2019, APSWREIS Inter 1st Year Counselling Dates available here. The Gurukulam, APTWREI Society, Tadepalli,Amaravathi has been running (07) institutions of Excellence (03) COEs / (04) SOEs for ST Students to provide a necessary academic environment and inputs and also providing specialized coaching to meritorious ST students to enable them to compete successfully in order to get admissions into All India Level Institutes such as IIT, NEET, IIIT, Medical Colleges etc. The selections will be made on merit basis through Entrance Test conducted by Gurukulam. The selected students will get all benefits extended by Gurukulam such as free boarding, lodging, dresses, notebooks & text books, bedding material, medical care and examination fee etc. Applications are invited from Boys & Girls for admissions into and 8th Class and 1st Year Intermediate for MPC & Bi.P.C Groups in English Medium with integrated coaching for IIT-JEE/NEET/EAMCET for the Academic Year 2019-20 in the following institutions functioning in Gurukulam. 5 School of Excellence, Srikalahasthi Girls 45 45 45 Guntur,Prakasham, Nellore, Kadapa, Kurnool,Ananthapur, Chittoor. *Note: All the above notified seats in (03) COEs will be filled through merit in the Entrance Test and in case of (04) SOEs, the left over seats (after filling with the passed out 10th class students from the respective institutions) only will be filled through merit in the entrance test. 1. All the ST students (Boys & Girls) who are appearing for 10th class in March - 2019 in TW Residential Schools, Ashram Schools, Govt. Schools and other Govt. Recognized schools are eligible to apply for entrance test of Intermediate course. However the admission of the candidate for intermediate shall be considered only when he should have secured a minimum B2 Grade( 7 GPA) in SSC March -2019 examinations besides entrance merit. 2. All the ST students (Boys & Girls) who are appearing for 7th class in April - 2019 in TW Residential Schools, Ashram Schools, Govt. Schools and other Govt. Recognized schools are eligible to write the 8th Class Entrance for admission in SOEs. 4. Parental Income should not exceed Rupees One Lakh per annum for College and school students. 5. Selected candidates have to produce necessary certificates like, Caste, Income, Ration card SSID No, the Aadhar card. Marks Memo, Study, T.C; Physical fitness certificates, 06 Passport size photos etc., at the time of admission. Selection of Students: Selection of students of SOEs & COEs shall be based on the regional merit (students of catchment districts) in common Entrance Test as per options opted in the online application form. However the admission of the candidate for intermediate shall be considered only when he should have secured a minimum B2 Grade (7 GPA) in SSC March -2019 examinations. All the eligible ST students only shall upload their details in online in the Gurukulam official website www.aptwgurukulam.ap.gov.in.The last date for the submission application form online is 25.03.2019.The hall tickets can be down loaded from the web site itself after duly submitting the application form online. 6 . Reporting students to allotted colleges (COE/SOE): 2nd week of May-19.